The next chapter in the Total War series has been out over a week now and I’ m bleary eyed as I type from spending way too much time trying to conquer Europe while holding the holy lands in Sega’s Medieval II Total War. I’ve been playing since the first title Shogun Total War took us to Feudal Japan, then to Medieval Total War and Rome Total War. Each title had an expansion pack to give you just a little more, keep you going a few more rounds. For the uninitiated, the Total War series follows a basic framework. 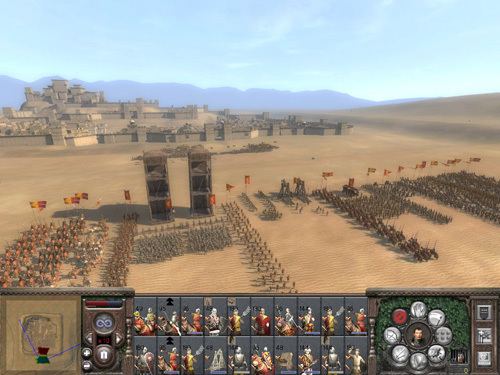 The game is divided into two sections: a turn based strategy game and real time strategy game. The real time strategy portion lets you control squads of troops on a map in real time to wage war against your enemy; you can zoom in to see their faces and swing their swords and zoom out to get a birds eye view of the entire battlefield. The turn based strategy game looks like a very detailed Risk board ( does anyone still play Risk; how about Axis and Allies? ) where you take care of everything else. The everything else but battles is actually very engaging and takes most of your time, and with Medieval II things have been improved. The game opens with your choice of five Western European nations in 1080 AD. Either you pick a short game of holding fifteen regions or a long game of holding fourty five regions. You pick one and start the game, giving you a view of the map and regions outlined. Each region you hold has a castle or city in it; castles specialize in troops and cities in money making. Both types can handle a small portion of the other’s functionality, but in cities you get basic troops and castles can only provide a moderate income. You have troops, clergy, diplomats, merchants, spies, assassins and family members to move around the board: each serves a function and you have to know when and where to use them. Like everything else money makes things happen, but this is a military game so fighting is why you’re here. Develop cities to make the money you need and castles to produce the troops you need to conquer other regions, which in turn will give you more cities and castles. One troop type won’t conquer the enemy, and the basic paper rock scissors mentality works here too. You’ll need spearmen to take down the enemy cavalry, swordsmen to attach the enemy spearmen and cavalry to swoop in and small enemy swordsmen. Leading this gaggle of troops are your generals, who with each win gain a better command ability; you want to keep everyone alive as they gain experience. All units, not just troops, gain experience from success and get better at their job. The more treaties your diplomat establishes the more persuasive he becomes, and so on. Typically you make armies to attack a neighbouring region. You move a spy into the city or castle to get information and possibly open the gate for you. Armies are moved in and you lay siege or assault; siege starves out the city and you get a weaker opponent, but while you’re sitting around the enemy may move in support so the assault gets it done. Once you win or lose diminished squads are moved back to a castle to be reinforced and brought back to the full number of troops. Full strength units are put into the new region to hold it; of course this is best case and a lot of times you’ll be holding a region by the skin of your teeth while you desperately try to build more squads and get them there in time. When two enemy armies meet they enter combat mode; either you let the computer calculate the outcome of the battle or you move into real time strategy mode and fight it out yourself. If it’s close I fight it out myself, but if I have an overwhelming force then I let the computer do it. The game takes many hours to get a win for your nation and saving time here and there on a foregone victory is one way to do it. Real time combat is handled very nicely. Each squad is represented by a banner on the menu and you control them. On each banner a graphic shows what that squad is doing: fighting, shooting arrows, that kind of thing. Group similar units together during a frontal assault or micromanage each squad; the game lets you handle the battle as you’d like. In Medieval II each unit moves and acts independently, making for thousands of individual units on a battlefield doing their thing. It’s amazing to see and you can’t help but zoom in to pockets of troops and watch them. You’re not left completely to do as you wish; the Pope and your Council of Nobles will give you missions and orders to follow. If you complete them you get troops or cash; not following gets you problems such as lowered morale or excommunication from the Catholic Church. Since it is the middle ages the Pope calls a lot of crusades and you have to join them by assigning troops to a general and fighting in the hold lands. Winning gets you a lot of cash, but failure means you not only gave an army up for a bunch or rounds but now they’re all dead. The game environment is engrossing and complete. The menus are simple and everything has more information and help available to you in game. All the troops and buildings have stats, all characters have their abilities listed. You have an adviser in the top left that guides you through new events as they occur. Graphics are smooth and give what you need to be a part of the world. I have a fast PC so I can turn up all the options and make it pretty, but turning things down doesn’t detract from the overall feel. Sounds and music are on the money. 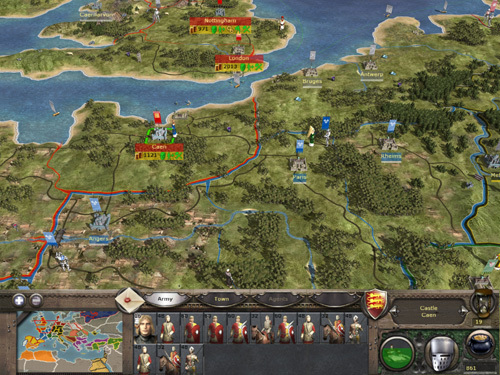 It’s obvious I love Medieval II Total War; if you’re a strategy fan then you owe it to yourself to pick up a copy.